Here is a wonderful recipe that took no time at all to put together. And it’s delicious—REALLY! We cut this lasagna up to take to my mother-in-law and family and I was hoping there was a little left over. 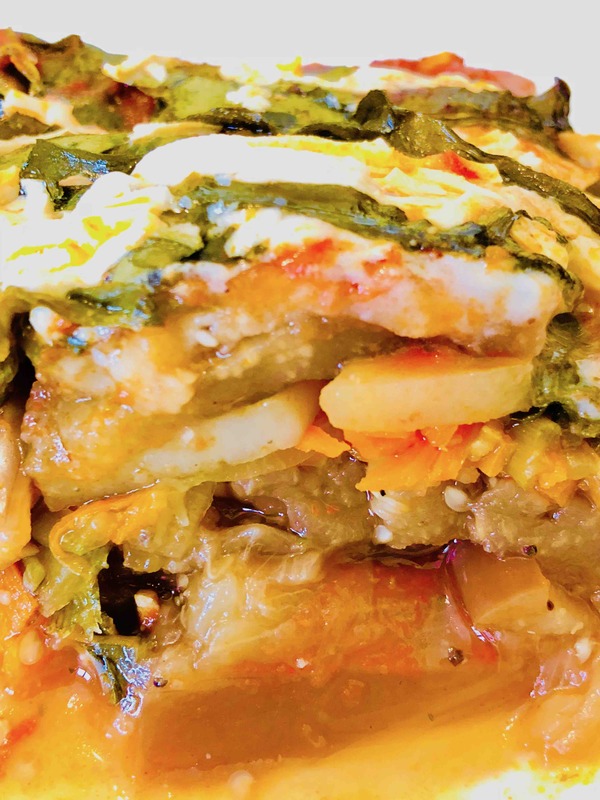 This lasagna is full of powerful anticancer agents and antioxidants such as eggplant, spinach, and carrots, and more. This tasty lasagna will do the body good… I Promise. 6 – Small Organic Eggplant – Cut into Cubes with the skin on… the skin contains lots of anticancer agents. In a 10 by16-inch deep baking dish put down a layer of cubed eggplant, and salt and pepper and add some of the seasonings, and a little bit of the onion and garlic. Then, add a layer of finely cut yellow bell pepper and then a layer of sliced potatoes. And again add some more of the seasoning, garlic, and onion. Then, add another layer of eggplant and again add some more of the seasoning, garlic, and onion. Then, add the sauce and then the spinach and the veggie cheese to top it all off. Poke holes down into the lasagna to allow the sauce to seep down into the bottom layers. Next, cover with foil and place in a 425-degree oven for 75 minutes until the sauce is bubbling on the edges of the pan and the cheese has melted. Let cool and then slice and serve. I find it works best to pop the whole thing in the frig and serve it the next day when all the flavors have really intensified. Powerful Antioxidant – Eggplant contains a phytonutrient called Nasunin that’s found in the dark purple skin of eggplant, it’s one of the most powerful antioxidants around (And it is only found in Eggplant). Nasunin has the ability to repair DNA damage, slow the aging process, and help keep diseases like cardiovascular disease, strokes, and cancer away. Nasunin is a phenolic compound like that found in green tea. Cancer – Nasunim is a powerful antiangiogenic compound that keeps cancer cells from creating blood supply… thus preventing tumor formation. Brain Protection – Animal studies show that Eggplant contains compounds that protect the fatty acids in the brain… and thus help to protect the brain from free radical damage. Chlorogenic Acid – Eggplant contains chlorogenic acid which is one of the best antioxidants on the planet. Protect your body from bacterial, fungal, and viral infections by boosting your immune system and preventing cancer. Low Glycemic Index – Eggplant has a low glycemic index of 15… making it great for diabetics. Nervous System – Eggplant contains soroparone & scopoletin which are both compounds that relax and soothe the nervous system. Weight Loss – Eggplant is very low in calories making it great for weight loss. And because it contains lots of fiber, it makes you feel full… thus you eat less. Also, Eggplant contains lots of water to make your skin and hair look great. Low in Carbs and No Fat – Eggplant has little to no fats and it’s very low in carbs. But remember if you add lots of egg, oil, cheese and other fatting things to eggplant it’s no longer a low-calorie food. Inflammation – Because Eggplant contains lots of great antioxidants it also helps with inflammation such as arthritis, joint problems, and other inflammatory diseases. Lowers Cholesterol and Blood Pressure – Because Eggplant contains chlorogenic acid and 13 other powerful antioxidants that lower bad cholesterol or LDL cholesterol. In studies with rats given Eggplant juice, their cholesterol went down drastically… and their arteries relaxed which lowered blood pressure. Vitamin K – Eggplant is a good source of Vitamin K to prevent excessive clotting… and thus prevent heart attacks. Contains – Eggplant contains B Vitamins for vitality and good mood, potassium for water regulation and heart health, copper for anemia, manganese for bone health and fertility, calcium and phosphorus for strong bones. Fiber – Plus Eggplant contains lots of great fiber to keep you regular, and promotes the growth of probiotic bacteria in your colon and boost up your immune system. Excess Iron – Iron is important for bodily function but too much iron can lead to higher cholesterol, cancer, and joint damage. The compound Nasunin found in Eggplant regulates iron allowing you to have the iron you need… without allowing excess iron to damage your body. Bitter Taste Important – When you cut open an Eggplant it has a bitter taste, that bitter taste is important because it contains all the antioxidant compounds. Growing – Eggplant grows in full sun and loves rich loamy soil… it’s easy to grow and will provide you with lots of Eggplant. Cooking – Eggplant can be steamed, baked, roasted, stuffed, boiled, grilled, fried, stir-fried, added to soups and stews, made into dips like babaganoush and many other ways of cooking this wonderful veggie. You can slice it add salt to get rid of some of the bitterness… then rinse and use the Eggplant in your cooking. Remember – Always Eat Organic Eggplant – Regular eggplant contains up to 6 cancer-causing chemicals, 12 hormone-disrupting chemicals, and 10 other disease-causing chemicals. Eat Organic and Stay Healthy! This entry was posted in Healing Herbs, Recipes and tagged and carrots, Casein Free, Dr. Haider’s Anticancer Eggplant Lasagna, Dr. Paul Haider, Having a Great Life, Healing, Health, HH, his lasagna is full of powerful anticancer agents and antioxidants such as eggplant, Master Herbalist, Organic Eggplant, Organic Garlic, Organic Garlic Powder, Organic Italian Seasoning, Organic Low-Sodium Marinara Sauce, Organic Potatoes, organic tomato, Photo, Recipe, Salt and Pepper to Taste, Spinach, spiritual teacher, ul Haider, USA, Whole Foods Plant Based Recipe, Will Do the Body Good, Yellow Organic Bell Pepper. Bookmark the permalink.